Supernatural returns to the alternate world once again for Sam and Dean to mount their much discussed rescue mission with the aid of Rowena and Gabriel. Early on the episode is set up as something of a War story with everyone gearing up for their trip to the other world. The score compliments this idea by taking on a distinct militaristic flavour suggesting what follows will be both exciting and action packed. Defusing that by having the portal fail because there wasn’t enough of Gabriel’s grace to sustain it for more than a few seconds was really effective as it was counter to expectations and brought in some unexpected yet welcome comedy early on. Naturally this is followed by jokes about Gabriel’s inability to perform and his supplied grace being premature because Supernatural is never above juvenile humour. With this being very near the end of the season it would be easy for the show to get bogged down in being very self serious and laser focused on mining as much drama from a given scene as possible. The commitment to comedy early in the episode is a welcome diversion and helps create some really memorable character moments. Rowena and Gabriel having sexual tension is one such example of how comedy can be used effectively as it allows the entire cast to use their comedic chops to sell the moment. 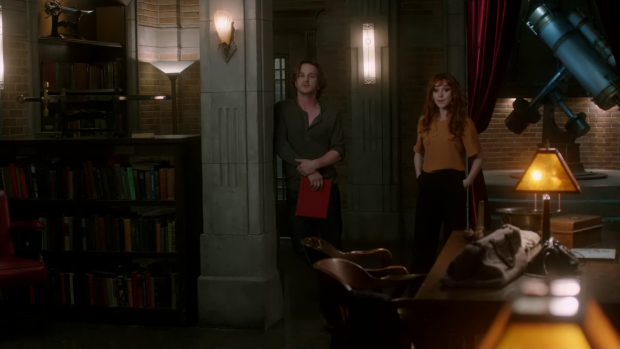 Having Gabriel and Rowena acting like teenagers trying to pretend that nothing was happening followed by the reaction shot of everyone else realising what was going on was priceless. Jensen Ackles in particular nailed the reaction which helped make it genuinely funny. There are small morsels of levity throughout the episode but the early scenes are the largest source of it. It comes across as essentially being the last laugh before everything kicks into high gear and the situation has to be taken seriously again. Since Gabriel’s Grace is depleted and will take a long time to recharge there is no choice but to go after the only other Archangel in existence. Sam is naturally resistant to the idea of going after Lucifer because confronting him is still very much a sore spot for Sam. It’s easy to understand why but necessity overpowers discomfort in this scenario as far as Dean and Castiel is concerned so they encourage Sam to put his trepidation aside and recognise what the situation demands. Sam is a professional and accepts that he will have to take part in things he isn’t comfortable with but he makes some good points about how much potential there is for this plan to spiral out of control. He points out that every time they have gone after Lucifer it always ends up with him escaping and overpowering them in some way. This is both recognition of the past while attempting to learn from it and foreshadowing for what will inevitably happen. Locating and capturing Lucifer doesn’t take long because the episode doesn’t have time to spend an extended period of time on a Devil Hunt. It’s reasonable to accept that Gabriel would be able to find him and having Rowena whip up a spell that can temporarily incapacitate him makes sense while also being a creative way to use the two guest characters. It seems easy enough to capture Lucifer because of how distracted he is after losing control of Heaven. He drowns his sorrows lamenting what he has lost and pining after a relationship with Jack. At this point everything feels really far beyond his grasp and it will clearly take him a while to bounce back. This makes it the perfect time to go after him and it’s an opportunity that is readily exploited. Once Lucifer is captured it becomes somewhat cathartic for Sam who gets to see his torturer in a vulnerable position and takes great delight in it. Jared Padalecki’s performance when Sam tells Lucifer exactly what he has planned for him is excellent; there is so much venom in his voice with more than a hint of pleasure. Rowena being tasked with guarding Lucifer also works really well as it allows Lucifer to tap into his ability to exploit weakness olin those around him. 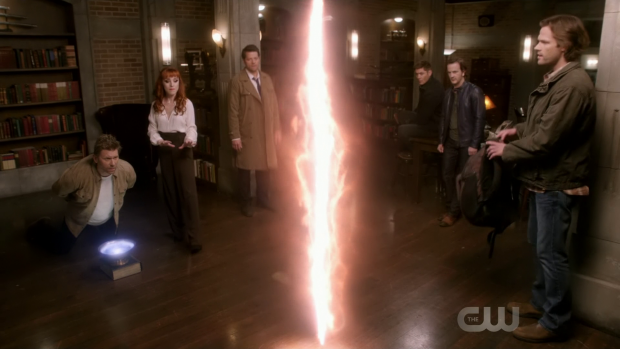 In the case of Rowena Lucifer took great pleasure in burning her alive at the end of last season and rightly assumes that this will be a side spot for her. He uses that I’m an attempt to goad her into losing her temper and therefore lose control of the situation. It seems to be a workable plan but Rowena is actually very focused on the overall plan and doesn’t rise to itm Part of this has to do with her seeing Lucifer as pathetic and unworthy of an emotional reaction. Eventually Lucifer does get under her skin and Rowena tries to get a reaction out of him by pointing out that Jack considers Sam, Dean and Castiel his fathers with Lucifer meaning absolutely nothing to him. It’s a cutting remark that might even be accurate but it is exactly what Lucifer wants as he uses Rowena’s moment of weakness to free himsellf and take great delight in threatening Rowena before she pushes him through the portal. Rowena and Lucifer’s interactions in this episode are really well done because it does serve as a reminder of Lucifer’s ability to exploit weaknesses in people. Rowena has plenty to go after and her recent experience with Lucifer gives him all the ammunition he needs to force a reaction of of her. Ruth Connell’s ability to show Rowena’s resolve slowly crumble is great to watch and the moment she snaps feels natural given the circumstances. This episode also shows that Rowena is developing as a character as she clearly regrets her lapse in judgement that frees Lucifer which suggests that she believes in what she’s doing with Sam and Dean to a certain degree. Her desire to make up for her error seems genuine and it’s likely that her redemption will continue by making her an important part of everyone coming back from the other world. As readers of the site know Rowena is far from my favourite character but the writers are doing excellent work with her at this point and Ruth Connell is definitely dialing back on Rowena’s more irritating qualities. The other world provided some opportunity for those involved to reflect on the current situation. It looks like Gabriel is being set up as essentially the next God. Castiel seems to champion having him in charge of Heaven because “upstanding Angels” haven’t managed to keep it going so Gabriel’s unconventional outlook on things could be what is needed to restore it to its former glory. Castiel has always had opinions counter to whatever position the other Angels tend to hold so hearing him say that the current system isn’t working and a change is needed has real weight to it. I’d like to see more development of a potential Castiel and Gabriel partnership as they work to rebuild Heaven in a more functional way. Sam and Dean have a pretty open conversation about how Sam feels in particular. Dean points out that he seems more focused and energetic now that they have crossed over. This is clearly because Sam feels like they are actually progressing for the first time in a long time. The portal is open, as far as he knows Lucifer is contained and they have a solid lead on where to find the people they are looking for. Jared Padalecki’s performance reflects the change in attitude and it acts as suitable pay-off for his emotional arc over the past few episodes. He has moved back and forth between pessimistic and optimistic but this feels more like realistic, at least as far as he sees it. I found the opening dream sequence really illuminating in terms of showing what Sam wants out of life. It’s a fairly simple dinner scene where both Jack and Mary are sitting around the table with Sam, Dean and Castiel. Sam clearly has a desire to have a stable family unit with Hunting as a part of it. This dream is important because his attitude later in the episode suggests that he feels that he is getting closer to that. Ultimately this is what he’s fighting for so establishing that with the dream sequence is a really effective way of confirming Sam’s motivations. The sequence in the tunnel is really well done in the way it’s executed with the dark and claustrophobic setting as well as the chaotic editing helping to establish a situation that quickly becomes overwhelming. Sequences like this call back to the show’s horror roots and allow a break in the more emotionally driven storytelling that fills much of the rest of the episode. All of the different elements are balanced really well in this episode as proven by throwing in a horror driven sequence. This also adds extra depth to the alternate world by giving an idea of what happens to the monsters when the Human population that serves as their food is cut down significantly. The answer is that they starve and become feral ghoulish versions of their former selves, at least in the case of Vampires. This can likely be extrapolated to other creatures as well. Sam’s “death” at the hands of rabid Vampires is really effective despite knowing that it wouldn’t be permanent in any way. It follows on from Sam and Dean’s conversation last week where Dean outlined his desire to protect Sam above anything else in his life. Sam being overwhelmed by Vampires and killed before being dragged off is the physical embodiment of Dean’s worst nightmare and it looks as difficult for him to take as would be expected. He can do little more than look on helplessly as he’s powerless to prevent it. It doesn’t quite add up that Dean would accept that Sam can’t be saved and choose to move on without him but the emotional heft of the moment is significant and feels impactful despite the obvious lack of permanence. This is the culmination of time spent making sure that both Cas and Gabriel have reduced power to make it believable that they could be overwhelmed like this. Mary’s simple “Where’s Sam?” question followed by seeing his lifeless body in the cave is really powerfully done creating a moment that is allowed to be devastating. Lucifer offers a helping hand by healing Sam almost immediately and using that as leverage to get him closer to Jack. Manufacturing a situation where Sam and Lucifer are in a room together and forced to talk is a great idea because of the history between them that I mentioned above though the episode could have done more with it rather than rushing through the first opportunity to have them alone together in quite some time. Sam’s hatred for Lucifer is well documented so forcing Sam into a scenario where he has no choice but to work with him if he wants to continue surviving. 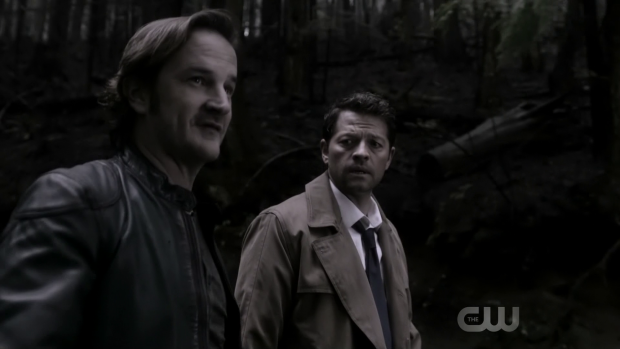 This leads to an engaging cliffhanger where Sam makes himself known at the camp with Lucifer in tow allowing Jack to finally meet his biological father. It’s an emotionally rich moment with happiness giving way to shock and finally confusion depending on what character you happen to focus on. It sets things up nicely for next week with the father/son meeting we have been waiting all season for. At this point I suspect that my theory about Michael making his way over to the other world is correct. It doesn’t feel like there’s enough time in this season to fully resolve that story in a satisfying way so I imagine the final two episodes will establish a problem to be solved next season. There is a lot of potential to create really interesting scenarios around Angel loyalty and general threat level in the next season with perhaps a possibility of Castiel meeting the alternate version of himself. The same could happen with Gabriel as well. An excellent episode that covers a lot of ground and juggles tones expertly. The use of comedy early in the episode is very effective and helps to undercut the seriousness of the situation without cheapening it. Using Lucifer as a supply of Grace for the portal works really well because it allows Sam to confront his feelings about his former torturer and achieve a form of catharsis when it appears that victory has been achieved over him. In general Sam feels that progress is being made for the first time in a long time once they arrive in the alternate world and have a lead on where they should go next. Sam’s death is really effective despite having no possibility of being permanent because it pays off Dean’s desire to protect his brother by having him face his worst fear and it happens as part of a great sequence showing a situation that quickly becomes overwhelming. Lucifer healing Sam provides an opportunity to explore the feelings of animosity between these characters but more could have been made of it. 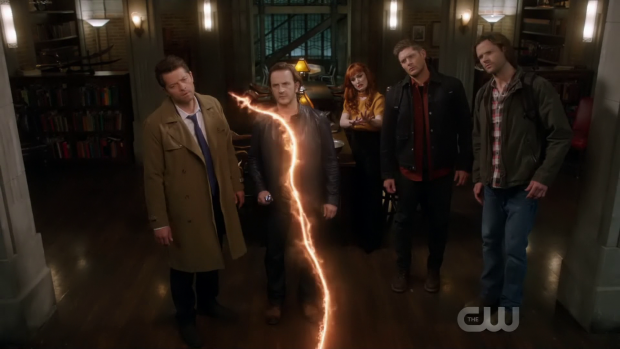 The final scene showing happiness, shock and confusion within seconds is great as well leaving the episode on a great cliffhanger with the meeting of Jack and Lucifer.